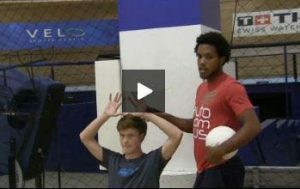 This post contains an elite level full youth club volleyball practice plan with Chris Austin, 2 Time NCAA Champion at UCI and coach to undersized boys team ranked as one of the top 10 teams in the country. 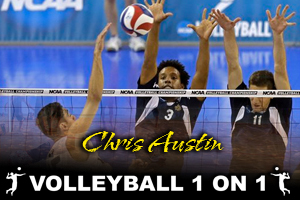 This post contains links to all 33 videos with Chris Austin from full volleyball practice. Why is this elite level youth practice plan? – This practice contains some of the best drills / videos / verbal coaching cues we have ever seen to help work with young setters before practice or during warm ups to develop, correct hand setting technique, footwork technique, rhythm, timing, decision making, dumping and more. These videos will change the way you run practice and make developing your setter, the most important person on the court a priority. Also these videos will help coaches who have little experience coaching setters develop their own skills so that they can do it with confidence. – This practice plan will help coaches see how to run and organize a practice efficiently and correctly. The sequence, timing and choice of drills that Chris uses is exceptional and Andor and Chris spend allot of time explaining each drill, the reason for the drill and why it is in practice when it is. – Verbal coaching cues Chris uses are some of the best we have ever seen. This is not surprising as Chris won championships under John Speraw and David Kniffin while at UCI winning championships. – Chris uses a jog, core, dynamic drill that should be viewed. If you are not using these concepts during your warm up you may be risking injury in your players and are not taking advantage of the latest in science to warm up correctly for volleyball. – Adding visualization exercise into practice that works for youth players. – Chris good skill building warm up drills that we have not seen and bring in new concepts when coaching youth players, particularly about maintaining good form during this phase of the practice. – Chris discusses new important ideas and technique for warming up the shoulder. Also Chris connects shoulder warm up with defense to help players work on more than one skill during shoulder warm up. – Chris offers new ways to run hitting lines t make it more game-like as well as work on transition offense and players footwork. – Chris introduces new concepts to serving that are compelling and may your serving strategy and team training. – Chris shares not only good drills, but also technique and verbal cues for teaching youth players how to joust and tool the block successfully. – Watching these videos with Chris coaches will also see a good role model on how to maintain a authoritative coaching demeanor while still creating a fun environment for learning and getting great results. – Coaches will see how to progress a practice so that specific skill building drills are incorporated into a 6 on 6 game like environment to see real results. Click the Links above to see all of Chris Austin’s incredible videos.